The new Alinco DJ-596T dual band transceiver does so much, yet it's remarkably easy to use. Full of advanced features, the DJ-596T offers simple programming and operation, powerful output and the optional capability of adding digital voice communications to your operations. CTCSS and DCS encode+decode are standard, along with a variety of tone bursts for repeater access or selective calling. The DTMF pad is standard and DTMF sequences can be stored in autodial memories. Convenience features include direct frequency input, alphanumeric channel labels and 100 memory channels that can each store up to 15 operating parameters. A nickel metal-hydride (NiMH) battery is standard, adding power and convenience. The DJ-596T looks simple, but remember, looks can be deceiving! 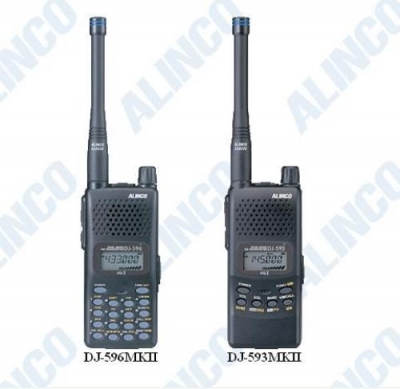 The DJ-596T places one of the world's most advanced transceivers at your command.